For the white dough, mix some of the cold margarine, confectioner’s sugar, vanilla sugar, and water. Add flour and knead thoroughly. If needed, add a bit more water. Wrap in plastic and transfer for approx. 10 min. to the refrigerator. For the black dough, mix together flour and cocoa powder. Mix cold margarine with sugar, then add the flour mixture and water. Knead, adding water if needed, until a dough is formed. Wrap in plastic and transfer to the refrigerator for approx. 10 min. Take the doughs out of the fridge and roll each out separately on parchment paper to approx. 1 cm/ 0.5 in. thick. Place the black dough on top of the white dough and lightly press to seal. 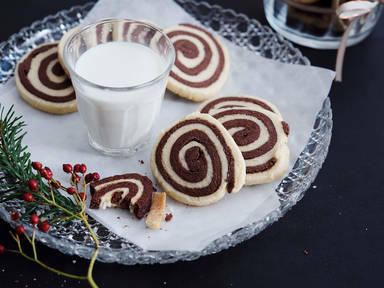 Carefully roll into a log to create a spiral. Wrap and transfer to the freezer for approx. 20 – 30 min. Pre-heat oven to 180°C/ 350°F. Remove dough from the freezer and cut into 1-cm/ 0.5 in. slices and transfer to a baking sheet lined with parchment paper. Place in the oven for approx. 12 – 15 min. Remove from the oven and set aside to cool slightly before transferring to a wire rack to cool completely. Enjoy!